As the year 2018 began, I’m sure many of you escalated the Water Crisis and Day zero to the number one topic of discussion, followed by the changes happening within the political realm in South Africa. It was almost refreshing in a way to attend a dinner party and not have security as the “hot topic”: Never the less, security remains a major priority to most South Africans and the ordinary Capetonian now has to spend money on water saving / storage systems and budget for additions / upgrades to their security systems to keep them fully functional and effective. CBAR is a corporate member of SAIDSA (South African Intruder Detection Services Association). SAIDSA sets down the standards of how alarm monitoring, armed reaction, alarm / CCTV installations and other disciplines within the security industry are to be conducted. Standards are set and SAIDSA accredited companies have to operate according to a strict code of conduct. The very reason such an organisation exists is to ensure that specific standards are set in each discipline within this specific segment of the industry and constantly evolves and adapts to changes in this sector. Currently there are vast numbers of alarm installers, many operating privately, often using their cell phones and vehicles as their office. Many have been in the industry for quite some time and others have just started up. It is very important when installing an intruder detection system to not only look at the bottom line of a quotation, but to do some form of due diligence on your potential installer. Having been operational for almost 20 years, CBAR has been and is still called upon regularly to complete work started by a contractor on an alarm and who now no longer answers calls on his cell phone. In other words, make sure you know the infrastructure of the company installing your intruder detection / CCTV, as well as the certainty that there will be an on-going relationship with the installations service provider for years to come to provide on-going technical support for you and your system. SAIDSA compliance also ensures that “inferior” products such as PIR’s (passive infra-red) detectors as an example, that do not give the best coverage, not be used. Information is circulated as to the better range of products on the market to avoid the “cheap and less effective” products being installed, simply to make quotes cost effective. These compromise the level of effectiveness of such a unit. Most technical staff are self-taught and the level of expertise and quality of the installations will vary from person to person. Here again SAIDSA has a set standard on how an alarm should be installed, which includes, but is not limited to the placement of sensors, tamper detection, correct wiring and an extensive check list to be signed off with the purchaser, post installation. Technical courses are run by SAIDSA to train technicians up to a specific level, empowering them to install to the highest optimal standard. On new installations, provided the client has allowed a SAIDSA approved company to install systems that comply with prescribed standards, a certificate of compliance will be issued to the end user, who may in turn forward this on to their insurer to possibly obtain a discount on their monthly household insurance premiums. Purchasing an intruder alarm system is deemed by most as a grudge purchase and people often opt for the lowest quote. In order for a security system to perform to optimum standards, quality components must be used. Sacrifices in the make and performance of the electronic equipment will undoubtedly be made to provide a “cheap” quote, so be sure to ask the consultant why a particular make of equipment is being used or recommended. There are numerous advantages of using a SAIDSA approved installer / armed Reaction Company and our staff will gladly guide you accordingly should you require any information in this regard. There are generally three ways your alarm system is linked to our monitoring centre. Either via a radio transmitter (standard or full contact ID – giving a zone description), a GSM module, which works via cell phone networks, or lastly telephone monitoring (best used with a radio transmitter backup). Important Note: Should your Telkom line be disconnected and a standard radio transmitter be in place as a secondary backup to your alarm; no zone descriptions will be received by our monitoring centre. Only a “burglary” or “panic” signal will be received. The monitoring centre operator will not be able to see which zone has activated. This is often used to track intruders’ movement through the premises as they move around during the intrusion into and around the property. By installing a GSM module or by replacing the standard radio transmitter with a full contact ID radio transmitter, our monitoring systems will receive the zone information which is useful in optimising the intruder detection system. As a member of SAIDSA, CBAR must adhere to the prescribed bylaws set down. Bylaw 3 – Requirements for an Armed Reaction Service, clause 13 refers to clients testing response times. Please be advised that “testing of response times are strictly prohibited”, as this could slow down the responses to genuine call outs that may be real emergencies. All our dispatches and response times are carefully monitored, with weekly reports of these times taken from dispatch to arrival and carefully correlated to ensure the quickest response times. Factors such as wind, outdoor foliage and user error result in unnecessary call outs, which may slow response times down. All our vehicles are fitted with real time management tracking systems and CBAR has the largest fleet of Armed Reaction vehicles in its area of operation so as to ensure that we are minutes away, 24 hours a day. It was announced by the National Treasury that Value Added TAX (VAT) will be increased from 14% to 15% effective 1st April 2018. Monthly service fees as well as all technical work conducted will be subject to this increase. 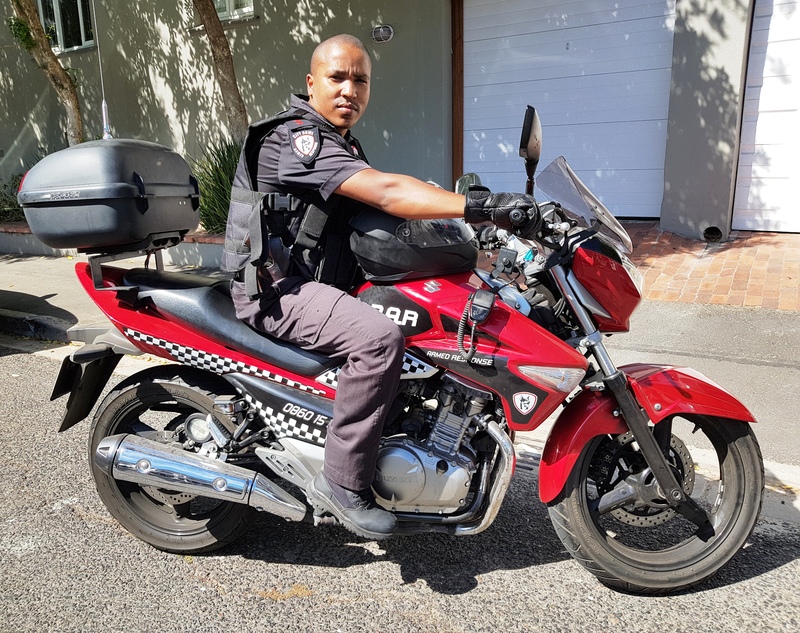 Above: Congratulations to ARO Andy Fernando Fortuin on his promotion to motorcycle patrol officer: CBD and surrounds. Please refer to our website www.cbar.co.za for our the updated crime statistics and incidents. Should you not wish to receive these informative newsflashes, Kindly reply “unsubscribe” to the above email address. Thank you for continuing to entrust CBAR with your security needs.